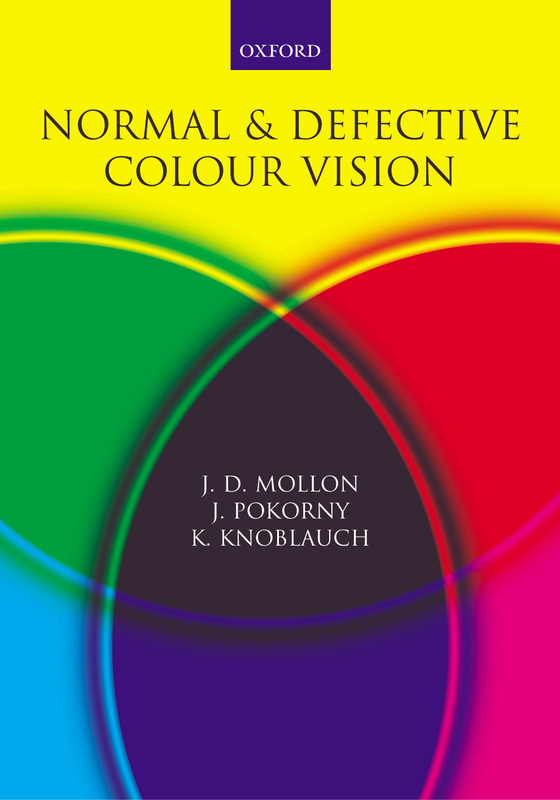 ICVS 2001 - Papers included in "Normal and Defective Colour Vision"
"Normal and Defective Colour Vision"
Ahnelt, P., Moutairou, K., Glösmann, M. & Kübber-Heiss, A. "Lack of S-opsin expression in the brush tailed porcupine (Atherurus africanus) and other mammals. Is the evolutionary persistence of S-cones a paradox?" Amano, K., Foster, D. H. & Nascimento, S. M. "Red-green colour deficiency and colour constancy under orthogonal-daylight changes"
Birch, J. "Extreme anomalous trichromatism"
Bowmaker, J. K., Parry, J. W. L. & Mollon, J. D. "The arrangement of L and M cones in human and a primate retina"
Buck, S. L. & Knight, R. "Stimulus duration affects rod influence on hue perception"
Campenhausen, C. von & Schramme, J. "Some properties of the physiological colour system"
Dain, S. J. "Evaluation of 'Color vision testing made easy'"
Dain, S. J. "Survey of the colour vision demands in fire-fighting"
Deeb, S. S., Jagla, W., Jägle, H., Hayashi, T. & Sharpe, L. T. "Genotypic variation in multi-gene dichromats"
Foster, D. H. & Amano, K. "Tritanopic colour constancy under daylight changes?" Hovis, J. K. "Lantern color vision tests: one light or two"
Jacobs, G. H., Calderone, J. B., Sakai, T., Lewis, G. P., & Fisher, S. K. "Effects of retinal detachment on S and M cone function in an animal model"
Jacobs, G. H. & Degan, J. F. "Photopigment polymorphism in prosimians and the origins of primate trichromacy"
Jagla, W., Breitsprecher, T., Kucsera, I., Kovacs, G., Wissinger, B., Deeb, S. S. & Sharpe, L. T. "Hybrid pigment genes, dichromacy and anomalous trichromacy"
Knoblauch, K. "Representing an observer's matches in an alien color space"
Koenderink, J. J. "Schopenhauer's 'parts of daylight' in the light of modern colorimetry"
Lee, B. B. "Structure of receptive field centers of midget retinal ganglion cells"
Leonova, A. , Pokorny, J. and Smith, V. C. "Spatial contrast sensitivity for pulsed and steady-pedestal stimuli"
Le Rohellec, J., Brettel, H. & Viénot, F. "Contribution of achromatic and chromatic contrast signals to Fechner-Benham subjective colours"
McCann, J. J. "Calculating appearances in complex and simple images"
MacLeod, D. I. A. The Verriest Lecture: "Colour discrimination, colour constancy and natural scene statistics"
McKeefry, D. J., Parry, N. R. A. & Murray, I. J. "Reaction times to stimuli in isoluminant colour space"
McMahon, C., Neitz, J. & Neitz, M. "Comparison of human and monkey pigment gene promoters to evaluate DNA sequences proposed to govern L:M cone ratio"
Mäntyjärvi, M. & Maaranen, T. "Color vision in central serous chorioretinopathy"
Marshak, D. W. "The neural circuit providing input to midget ganglion cells"
Mattiello, M. L. F. de, Maneiro, M. & Buglione, S. "Sensitivity to movement of configurations of achromatic and chromatic points in amblyopic patients"
Mollon, J. D. "Thomas Young and the development of the trichromatic theory"
Moreland, J. D. & Westland, S. "Macular pigment: Nature's notch filter"
Neitz, M., Bollinger, K. & Neitz, J. "Middle wavelength sensitive photopigment gene expression is absent in deuteranomalous color vision"
Nerger, J. L., Volbrecht, V. J. & Haase, K. A. "The influence of rods on color naming during dark adaptation"
Nolan, J. B., Crognale, M. A. & Webster, M. A. "Color naming, color categories, and central color-coding in a case of X-linked incomplete achromatopsia"
Paramei, G. V. & Jaschinski, W. "Convergence as a function of chromatic contrast: a possible contributor to depth perception"
Robson, A. G., Kulikowski, J. J., Korostenskaja, M., Neveu, M.M., Hogg, C. R. & Holder, G. E. "Integration times reveal mechanisms responding to isoluminant chromatic gratings: a two-centre Visual Evoked Potential study." Ruprecht, J. J. & Schertler, G. F. X. "Electrons and X-rays reveal the structure of rhodopsin: A prototypical G protein-coupled receptor. Implications for colour vision"
Schröder, A., Erb, C., Falk, S., Schwartze, G., Radermacher, J. & Winter, R. "Colour-vision disturbances in patients with arterial hypertension"
Silveira, L. C. L., Damim, E. T. B., da Conceição Pinheiro, Rodrigues, A. R., Moura, A. L. A., Côrtes, M. I. T., & Mello, G. A. "Visual dysfunction following mercury exposure by breathing mercury vapour or by eating mercury-contaminated food"
Shapiro, A. G., Hood, S. M. & Mollon, J. D. "Temporal frequency and contrast adaptation"
Shevell, S. K. & Cao, D. "Chromatic assimilation: evidence for a neural mechanism"
Smith, V. C. & Pokorny, J. "Psychophysical correlates of parvo- and magnocellular function"
Smithson, H. E., Sumner, P. & Mollon, J. D. "How to find a tritan line"
Sumner, P. & Mollon, J. D. "Did primate trichromacy evolve for frugivory or folivory?" Sun, H., Lee, B. B. & Rüttiger, L. "Coding of position of achromatic and chromatic edges by retinal ganglion cells"
Wolf, K. & Hurlbert, A. C. "The effect of global contrast discrimination on colour appearance"
Ventura, D. F., Costa, M. F., Gualtieri, M., Nishi, M., Bernick, M., Bonci, D. & De Souza, J. M. "Early vision loss in diabetic patients assessed by the Cambridge Colour Test"
Ventura, D. F., Silveira, L. C. L., Rodrigues, A. R., de Souza, J. M., Gualtieri, M., Bonci, D., & Costa, M. F. "Preliminary norms for the Cambridge Colour Test"